Dr. Jessye Talley attended North Carolina Agricultural & Technical State University, where she received all of her degrees in Industrial & Systems Engineering with a concentration in Operations Research. Her research expertise includes stochastic and deterministic modeling of supply chains using stochastic programming, Markov chains, differential equations, linear programming, and queueing theory. During her master’s degree, her research consisted of developing a stochastic facility location model, which used stochastic programming to determine the optimal number of teams and supplies that should be prepositioned to begin port recovery and fix aids to navigation after a hurricane occurs. Additionally, within a research group she helped to develop an interactive simulation model to quantify the impact of port disruptions. Her doctoral work entailed the safety and defense of food supply chains, which was modeled using compartmental models to show the progression of the illness of a consumer from eating a contaminated food product and the effects of interventions. Dr. Talley’s current research interest consists of applications in humanitarian relief, emergency preparedness and response to address ports, healthcare, and food supply chain safety and defense. 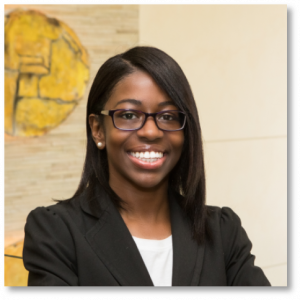 Dr. Talley is currently a lecturer at Morgan State University in the Industrial & Systems Engineering department. According to the Centers for Disease Control and Prevention (CDC), in 20ll, 80% of pathogens transmitted through food were unspecified agents, causing uncertainty in pathogens that could potentially lead to consumer illness. The purpose of this research is to develop models that will help quantify consumer morbidity and mortality, consider the impact of various characteristics of the consumer on the spread of contamination, and provide recommendations for interventions to public health officials. This problem occurs when a chemical or biological agent, at any point in the food supply chain, contaminates a food product. The final product can reach the consumer from one of three distribution channels: food retail, food manufacturing, and food service. 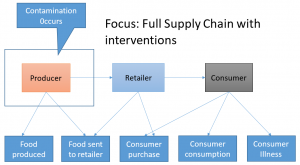 These models consider several factors such as: purchasing and consumption patterns of consumers, geographic distribution of contaminated food products, and lag time between purchase and consumption. Data of these factors are gathered by a food consumer behavior survey or the CDC. Compartmental models are applied to simulate different cases of consumers and food, causing illness from a food contamination event and incorporate a diverse set of interventions into the system. This will help to understand the spread of contamination and the reduction of people that can become ill. The results will show the number of consumers exposed increases linearly as a function of the consumption and purchasing. Using some type of control measure can reduce the amount of illnesses in the total food supply chain for a food system. Timing of food recalls can change the dynamics of the food system.